Located in Central America, Costa Rica is a small gem placed in between the continents of North and South America, and the Atlantic and Pacific Oceans. This critical geographic placement, coupled with its tender age of only 300 million years makes Costa Rica one of the most ecologically diverse places in the world. Its twelve climatic zones host 5% of the world's flora and fauna, with new discoveries cataloged daily. This enticing array of earthly splendor is enhanced more by its long standing political stability, demilitarization, and high standard of living. Of its four and a half million inhabitants, over fifty thousand are welcomed foreigners who have chosen Costa Rica for its beauty, perfect climate, wonderful people, and affordable cost of living in a stable society. 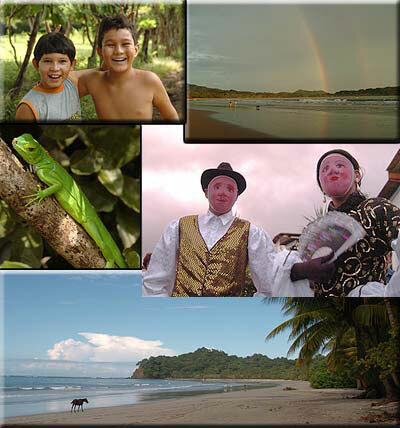 Costa Rica is also one of the world's top tourist destinations, drawing hundreds of thousands of visitors annually. One has a choice of vacationing in an all inclusive resort on a breathtaking beach or a secluded mountain getaway and reveling in the awesome beauty of one of Costa Rica's thirteen National Parks. Whether observing the turtle migration in Tortugero, or bathing in the thermal waters under Arenal Volcano, a visit to Costa Rica guarantees an adventure for all. It is no secret that very few laws and restrictions oversee the Real Estate business in Costa Rica. Therefore, there are some basic but essential procedures you can follow to insure that you obtain the best value with your Real Estate investment, and that a successful transaction is achieved. This includes dealing directly with the seller. An agent should assist both of you, communicating offers, counter offers and terms until both parties walk away with a satisfactory agreement. No amount of experience in dealing with real estate in another country can be insurance against a scam or being victimized by the common practice of "Sobre Precio"(over pricing). The best way to protect yourself when purchasing real estate in Costa Rica is to assume a very active role in the entire process. We at Green Mango S.A. take pride in our business ethics and the service we provide. Our clients rest assured that they have negotiated the very best price and terms directly with the sellers, and have been thoroughly involved in every aspect of the transaction. We all face a new set of challenges while making a transition to another culture and environment. Having experienced this first hand, we at Green Mango S.A. are committed to helping you through the processes beyond the purchase stage. We will gladly connect you with reliable moving companies, suitable rentals, auto finders, architects, contractors, and skilled personnel for the periodic care and maintenance of your land, as well as guide you through and introduce you to the local business community. Having helped many others who we now consider good friends, we happily await newcomers and are glad to show you the basics of this friendly little town we call home. Green Mango S.A. now offers several home plans featuring elegant and modern designs that may be paired in combination with any of the properties we feature in our listings. We make it possible to avoid the headaches of building in a foreign country by working with skilled, experienced, English speaking builders and architects who take pride in their work and have a solid reputation to stand on. Puriscal Projects S.A. and Ingenieria Civil ICSA S.A. are locally established companies that understands the logistics pertaining to building in Costa Rica. They have reliable crews who produce quality craftsmanship resulting in a home built with high standards that will live up to your expectations. Of course, you may also work with them to create a design of your own and have confidence that your construction will be completed as scheduled, and at a fair market price. For more information please visit our new section featuring unique and stylish home designs and models. Costa Rica is packed full of exciting and beautiful destinations and by far the most thrilling is Arenal Volcano and National Park. Nothing can prepare you for the awesome sight of red hot molten rocks tumbling down the mountain side and the rumbling vibrations of this towering giant. The incredibly fertile area surrounding Arenal is abundant in lush vegetation with innumerable bird species and other wild life. Several days may be enjoyed here filled with walks through the rain forest, horseback rides, canopy tours, world renowned water sports, and of course relaxing hours soaking in the natural thermal pools. The gently rolling country side is also ideal for cycling and scenic drives. Over all Arenal Volcano is one destination which should not be missed. 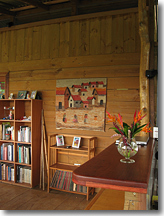 Here are a few of suggestions for books with excellent information about Costa Rica. Name : COSTA RICA With the Best Beaches and Outdoor Adventures. * These publications are normally found at your local Public Library. One of our favorites for non commercial news and stories from around the world. Fun and educational games for your kids. 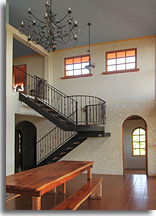 We specialize in the charming mountain area of Puriscal in Costa Rica. Many have already discovered this desirable location and chosen it for its spring like climate, ample services and easy access to San José, the airport and Southern Pacific beaches. The small town of Santiago de Puriscal offers a unique rural and friendly ambiance characteristic of the agricultural community. There are many ideal pieces of land, farms and mountain homes for sale with varied sizes and qualities suitable for retirement, vacationing, investment, eco-development, reforestation and tourism projects all with mountain, Central Valley, ocean views and even volcano views. 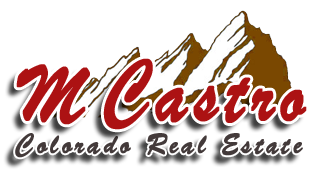 Puriscal Real Estate Services by Green Mango S.A. offers listings in the neighboring areas of Turrubares, Mora County as well as Guanacaste. We now offer complete constuction services and a variety of pre-designed home models including modern, and traditional styles. Please feel free to browse through our listings and photo galleries. You are also welcome to give us a list of your needs and desires, and we will work to find your dream home or the piece of land for you to build it on. We work strictly on commission as allowed by Costa Rican law and our policy is always to facilitate buyers to negotiate directly with sellers to insure clear and transparent transactions. This beautifully designed post and beam construction incorporates the rich tones of wood with the backdrop of tropical gardens. The 1800 square ft house sits on a 1.48 acre lot which includes fruit trees, garden areas, a Tilapia pond and a potable water well. Private and safe area, 3450 ft altitude, 8km from Santiago Puriscal, 1.5 km from San Juan and Barbacoas Communities in Puriscal. About 20 minutes drive to new state hospital, 45 minutes to private CIMA hospital and major shopping mall in the Escazú area. This Puriscal farm has everything needed to start your new life in Costa Rica.The land is already primed for Coffee crops, mature avocado and several citrus trees can be harvested throughout the year and provide shade and natural beauty to the landscape. Water for animals and crop irrigation is in abundance from the two year round creeks which border the property. A sturdy stable can shelter up to six horses with two additional elevated stalls for goats. As well, there is a generously sized, secure chicken coop and an above ground tilapia pond. Another major asset is a water well and holding tank that provides additional, gravity fed water to the home and property. The bath and kitchen have simple but very effective solar heating systems set up. All services are available and a private water system is in place. This incredible opportunity combines a remarkable piece of land with an exquisite mansion which is unquestionably the finest construction in the area of Puriscal. Tucked into the picturesque hills of Mercedes Norte, Puriscal, this two bedroom two bath home offers creative comforts integrated with the beauty of nature. The truly unique green living design takes advantage of the excellent climate found in high altitude (3350ft) tropical environments with it´s open air kitchen, dining and living spaces. Inside, two ample, master suites feature spacious ventilated closets and private baths, one with a deep soaking tub. Public water, electricity and telephone with high speed internet are already in service. Located just North of Santiago, Puriscal, the nearly 5 hectares of beautifully landscaped terrain are host to abundant trees including hardwood and various tropical fruits. A densely forested area protects one of the three natural springs which feed a creek that runs through the property providing service water to the grounds and a gorgeous natural setting for birds and other wildlife. Privacy and views to the Central Valley are just part of the charm of this unique property which is only three miles from Puriscal center, and under five minutes from the new state hospital. Copyright © 2004-2018 - Green Mango S.A.